Delacquering - Gillespie & Powers, Inc.
Gillespie & Powers Patented Mass Flow Delacquering design allows UBC and/or Scrap to be processed. With Multiple Units in production all across the world This design produces a quality de-coated material that helps improve Metal recovery that is found no where else in the industry. Since the beginning of 1997, an innovative process has been demonstrated for turning aluminum scrap from stamping plants and used aluminum into feedstock that secondary smelters can use to produce new products. The NICE3 (National Industrial Competitiveness through Energy, Economics, andEnvironment) program and Philip Services Corporation (formerly Roth Brothers Smelting Corporation) are cost-sharing the demonstration to decoat metal using indirect-fired controlled atmosphere (IDEXTM) kilns. 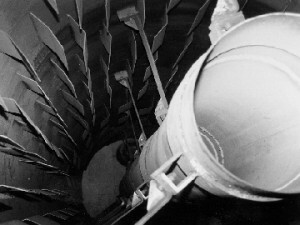 These kilns are different from the kilns usually used to remove machining lubricants and oils from the scrap. 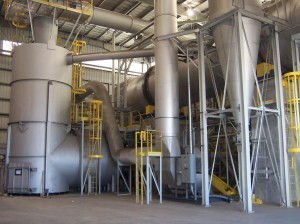 They are better able to process solid organics like rubber and plastics than conventional kilns. Dust formation and emission of volatile organic compounds (VOCs) are minimized. 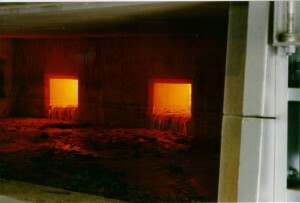 The kilns’ better temperature control leads to less oxidation and less dross in the smelter, minimizing product loss. And, because the heat released during the oil combustion is captured for use in the decoating process, energy requirements and operational costs are reduced.